Have you checked out Shelli Gardner's blog yet? 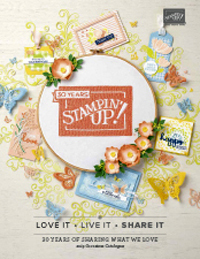 Shelli is the CEO of Stampin' Up! and you can find her blog at www.soshelli.com. Shelli plans to have a challenge each month (anyone can play along) and this months challenge was to create an item with a 'Celebrate' theme. Here's mine, a layout about celebrating friendship's with the other demonstrators who went on the Incentive Trip to Palm Cove. If you click on the picture you will get a larger view and be able to read the journalling and the words around the edge of the circle - celebrate friendships, celebrate creativity, celebrate relationships and celebrate success. The tab to the left of the photo pulls out and is attached to a list of everyones names. Other: Holiday Harmony Designer Series Paper, Rose Red brads, Ice Rhinestone Brads, Versamark, Clear embossing powder, brayer, Cherished Memories rub-ons, Lotsa Letters chipboard letters, Crystal Effects, Round Tab Punch. Time for some cards don't you think? You might want to grab a cuppa for this post - I have lots to show and tell. Some creations, my free customer drop in days next week and also my Christmas Card kits which I have been busily working on this week - if you have already signed you are in for a real treat! If not, there's still plenty of time and I'll provide more information further down the post. First I wanted to show you this card Ros and I affectionately nick-named the 'Rubics Cube Card'. Teresa Brown, another demonstrator on the incentive trip brought this type of card along as her swap card. It's one of those never-ending types of cards that twists and turns to allow you to display lots of stamping. I adapted mine into a Christmas Family photo card, which allowed me to display 5 family photos. I think this would be a great card for relatives at Christmas. Here's a few of the many views. The actual card lays flat, but it was easier to photograph mine this way. I have used all Stampin' Up! supplies including the Seasons of Joy and Merry Merrystamp set. The cardstock and ink colours are Whisper White, Soft Sky, Purely Pomegranate and Wild Wasabi. I have also used the Cherished Memories rub ons and Purely Pomegranate satin ribbon. The embossing has been done using my new Cuttlebug. I can only accommodate a small group of 6, so I need you to call me on 9735 2946 or email meto check there is a place available. 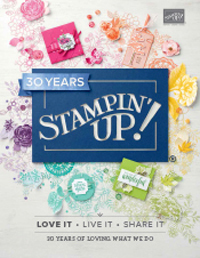 Priority is given to my regular customers who purchase their Stampin' Up! products from me. If you are not a regular customer but would like to become one, give me a call and I will try and fit you in. The sessions will be help once a month (the first week of each month) and I am hoping the groups will turn into a lovely group of regulars who develop friendships while they enjoy creating. You can bring your own projects to work on and there will be lots of projects to look at for inspiration as well. I'll have some stamps sets out for you to play with and there is just a $5 charge if you would like to use my cardstock and ink during the session. Please bring your own adhesive, mat and trimmer. Here's a few more quick cards to show you. This is a super quick one I made using the Stampin' Up! Lovely Labels set (the circle greeting). It fits perfectly into the 1 1/4 punch and I have used the 1 3/8 punch to mat it, and the designer label punch as a backdrop. The paper is from the Rose Red Prints range and I have used Rose Red, Pretty in Pink and Chocolate Chip cardstock (stamped with one of the flourishes from Priceless). A bit of Chocolate satin ribbon and we're done. Love these colours together. These last two are a couple of the make and takes we did in Palm Cove. The first one is a mini card and we used the Stampin' Up! scallop border punch on this. This will be available for sale in Australia on December 1st which is very exciting. We also used a new set called Ocean Commotion which will be available in the Summer Mini Catalogue as well. This one is also an Ocean Commotioncard (how gorgeous is that flourish seaweed?). I like the matching stamped envelope here too. Have you noticed what a great image you get when you stamp on the Stampin' Up! envelopes? The paper used to make them has a really smooth finish and that's what gives such a great image. Don't forget to sign up if you want step by step instructions (18 projects over 3 months!) on making your own Christmas cards, as well as cool stamps and matching embellishment packs. The first orders will be sent next week and I know you (and the lucky recipients of your handmade cards) are going to love what we have come up with! You can find all the information about how to join here. Hello friends. As you know I was one of the lucky 25 Stampin' Up! Demonstrators who earned the 2008 Stampin' Up! Incentive Trip which was an all expenses paid trip for 2 people to the beautiful Angsana resort and spa in Palm Cove. We've just returned, so I thought I would let you know all about it. I took my downline Ros along with me. Unfortunately I was sick for some of the time, but I still managed to have fun and be spoilt! The place we stayed was really lovely. Ros and I had a FAB apartment overlooking the pool each with our own room and bathroom. It was just gorgeous. They had the oil burner going before we arrived and there was a pressie from Stampin' Up! and the resort waiting for us, as well as a sign on the door indicating we were a trip achiever. On the first night we had a welcome dinner at the resort restaurant which was absolute beachfront! It was great to catch up with everyone over a yummy beachside BBQ. We then hopped on the bus for our first group activity which was a lawn bowls party and we were divided into teams based on Stampin' Up! colours, with shirts waiting for us in our room. I DID score the much coveted (NOT) Yoyo Yellow team shirt. Our team got to play against Shelli (bowling below) and Stirling's team (our wonderful US CEO and here husband who were delightful company the whole trip), so that must have been consolation for the colour choice, lol. It was a fun night, but we were all exhausted from a long day and early morning flights. When we got back to our room there was another gift waiting for us of a lovely lightweight hoodie with the trip logo. Too spoilt! I totally missed Thursday as I was sick, but the lovely Ros spoilt me with momentos from the trip. We actually had a really relaxing Thursday night in with room service (the resort food was amazing) and watching the DVD we were given of the WOW presentations from US demonstrators. That was our gift for the day - it was all set up on the telly when we came back into our room. Friday morning was when we all got to swap the cards we had made for the other demonstrators. We also got to do some make and takes using a brand new stamp set and a play with the NEW scallop border punch which will be here in Australia very soon (there were very loud cheers to that announcement!). I'll share the swap cards and the projects we made soon, but here are some shots of our goodies and the gorgeous Sarak Klass from Perth having a peek for the first time. There was also lots of opportunity to mingle with Shelli and have a group shot with all the demonstrators and Shelli, Aaron (our Australian Manager) and Emma (New Zealand). That's me second row from the top, in the middle between Jayne Mercer and Yvonne. Friday afternoon I had the most luxurious 2 hour Thai massage at the resort spa. It was amazing and the room was beautiful with open doors leading onto the beach so I could hear the waves. There was even an outdoor courtyard shower but there seemed to be a few too many people on the beach and not much between me and them so I wasn't game for that!Our gift Friday night was a gorgeous monogrammed bathrobe which is so soft and luxurious. One of the highlights photo wise was on Saturday, all the demonstrators dressed in their robes and had their photo taken as a group down by the pool (with the fearless Aaron throwing himself across the demonstrators!). I also had a chance to take a few pics around the resort including this gorgeous flower. If you know what it is can you tell me please? The beach wasn't exactly picture perfect blue and calm, but it was very relaxing still if that makes sense? Saturday night was our farewell dinner, which was amazing. We took a bus trip for 45minutes up into the hills and dined at the Cairns wildlife park, in a wire caged enclsure between two very hungry and energetic prides of lions. Ros got some great pictures of the lions I think. The meal was a BBQ and there were lots of delicious things to dine on including Barramundi and Wild Bore sausage! The only pictures I have from this night are of the karaoke on the bus on the way there. Wow, some of these husbands can sing. Here we have Tim (Sarah Klass's partner) crooning a song I can't quite recall, and Dave (Marelle's husband) with a very energetic version of Summer of 69 (he can sing like Marelle can stamp which is a huge compliment to him!). and here is Janelle from the US, who along with Christa, wa responsible for the planning and day to day operation of the event (and OMG, what an AWESOME job they did. No detail was overlooked, we were so well looked after. Thankyou! As much fun as I had, I really missed Paul and the boys and was very eager to get off the plane when we landed in Melbourne. Sam ran into my arms the second he caught sight of me and that was so cute. I came bearing gifts of course, and the boys were VERY impressed with their crocodile hats and pen holders. Well I think that's all for my roundup. If you have made it this far you deserve a medal! Back to normal programming and some cards over the coming days! 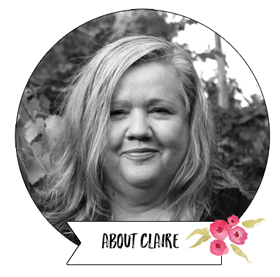 Today I would like you to meet another of my team of Stampin' Up! Demonstrators, Sue Madex from Avondale Heights. Sue joined the team on the spot at a workshop in January and is loving Stampin' Up!. Sue runs regular classes at her home in Avondale Heights. The next classes she has coming up are Technique classes on August 28th and September 11th. At these classes you can learn some great new stamping techniques (applicable to both scrapbooking or cardmaking) so you can get the most from your products. You will also find Sue at the Milleara Craft Market in Avondale Heights on the 4th Sunday of each month. You can find more information about Sue's events on her blog here. Scrapbooking or cardmaking? I love making cards but it has to be scrapbooking for that aaahhh feeling. Who would be at your dream crop? I really like scrapbooking with my mum and sisters so I think I’d have a few Madex chairs at the table. Plus when I first got interested in scrapbooking I was so inspired by Rachel Richter and Helen Williams so they would be on my dream list along with anyone on the team at Simple Scrapbooks (my favourite mag). If you could take 5 SU items to a desert island what would they be? 5 – now that’s tough. Hmmm, my case of cardstock, Rich Regals markers, Stampin’ Dimensionals, current favourite stamp set (right now it is Always) and some ribbon. No scrub the ribbon, I’ll take an Idea Book/Catalogue along to read while I lie under a palm tree. What are your other passions in life? Family, photography and my 200 litre tropical aquarium. Favourite SU colour combination? So many favourites. I think today I will say Elegant Eggplant, Purely Pomegranate and Old Olive, with some Whisper White to set it off. 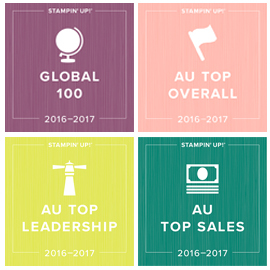 How has SU changed your life?- I was a different person before Stampin up! It has given me the power to rediscover myself. Lost in depression for many years and had no clue where my life was going. Meeting Claire has changed all this. I have vision, confidence and pride and so look forward to the future, Thank you Claire. Who would be at your dream crop? - that's a hard one as there are so many talented ladies out there but I adore, Janine Kaye, Kelly Ingram and Kim Ogden I could keep going though. If you could take 5 SU items to a desert island what would they be? Ooooh ..5 is not enough....stamp-ma-jig, Always stamp set, my ink caddy (with inks...is that cheating? ), stampin dimensionals, stampin scrub ( and hope they have some paperbark trees to stamp on!). What are your other passions in life? Well apart from my family.... at the moment I am passionate to shift some weight off my body (walking everyday) so that I can be the mother that I know I am on the inside. What's your favourite Stampin' Up! colour combination? Old olive, Purely Pomegranate, Blue Bayou, River rock, Whisper White with a touch of silver bling. Tanja will be will be in the beautiful Loch Village at the Arts and Craft Festival on Sunday August 31st, showing people the magic of Stampin' Up! and letting you all have a play with the beautiful products. There will be an array of photography, ceramics, jewellery and much much more. Historic Loch Village is an easy drive, just over one hour to Melbourne (mel ref 612 S9) so why don't you pop down for a visit. Tanja will be giving away some great door prizes and booking gifts and would love to see you there. Back tomorrow with another team member.